These days the state Volga Russian folk choir is the only group in the Volga region that represents the richest song heritage of the peoples of the Volga region at such a high professional level. Volga folk choir was founded in February 1952 by the decision of the RSFSR government, and Petr Miloslavov became the founder and its first artistic director. The collector, connoisseur, researcher of expressive Volga melodies, he set a unique for his time arrangement of the choir artists on the stage in such a way that one can hear the entire choral palette, all the timbres, merging in a powerful choral sound from any place in the hall. Surprisingly soft manner of singing is the main feature of the Volga choir. The founder of the group Petr Miloslavov organized a platform where folk art masters and young talented followers could freely improvise and carry out creative experiments. 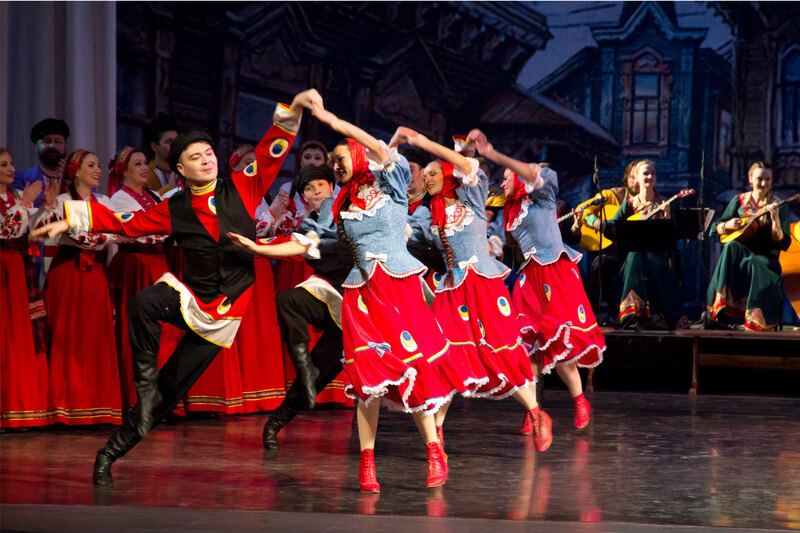 Thanks to this approach, a group of talented musicians was formed in the Volga folk choir. The benefits of their activities are up-to-date even today. Songwriters Venjamin Burygin and Viktor Bokov, composers Mikhail Chumakov and Grigory Ponomarenko worked here in different historical periods. No surprise such an environment enabled the creation of many songs that have become folk: "Ahk, Samara-gorodok (Ah, Samara-town)", "Ivushka (The Willow)", "Yest na Volge utes (There is a cliff on the Volga)", "Volgari pojut (Volga people singing)", "Iz-za ostrova na strezhen (From the island to the meadstream)". Among them is the famous "Belosnezhnaya Vishnia (Snow-white Cherry)", later included in Ludmila Zykina's repertoire. In 1970 a brilliant choreographer Vyacheslav Modzolevskij who fully changed the development of folk dance, came to the glorified group. Today the state Volga Russian folk choir continues searching for new manners of performing folk songs and dances. The harmonious combination of traditions and innovations is the most important secret of success of the Volga choir performances.